Shop Tama HP900PWN Iron Cobra Power Glide Double Bass Pedal With Case from AMS with 0% Interest Payment Plans and Free Shipping. The Iron Cobra HP900PWN Power Glide is a twin kick drum pedal for the serious player. The pedals’ solid foundation can be attributed to its Super Stabilizer design that incorporates a wider base plate and frame for absolute stability. At each pedal’s heel, the specially designed 3-piece Hinge Guard Block provides a more durable hinge point and also lengthens the footboard for increased leverage. At the heart of the Iron Cobra is the Power Glide cam, which has been upgraded to the lighter, smoother, more natural feeling LiteSprocket design. This cam is an offset double-chained Power Glide cam, which accelerates the stroke powerfully as it travels toward the bass drum head. The Speedo-Ring rocker cam is yet another example of streamlining, eliminating spring friction with a high quality built-in ball bearing rocker. The Quick-Hook spring attachment eliminates wobbling, provides maximum power transmission to the Speedo-Ring, and helps facilitate quicker setup. To further improve speed and beater stroke action, the adjustable Cobra Coil spring-return constantly works to push the footboard back to its original position, tightening the relationship between player’s foot and the pedal. Perhaps one of the most ingenious developments of the HP900PWN is its Swivel Spring Tight tension locking mechanism, which is designed to rock or “swivel,” allowing freer spring movement and a smoother overall feel. The smartly redesigned Power-Strike Cobra Beater provides a fatter, yet more focused sound and optimizes beater action for strong, precise impact. Finally, the Iron Cobra brings an end to makeshift methods of trying to protect the bass drum hoop: the Para-Clamp II Pro holds the pedal securely to the bass drum hoop without scratching it or slipping, thanks to an enlarged rubber padded clamp piece. 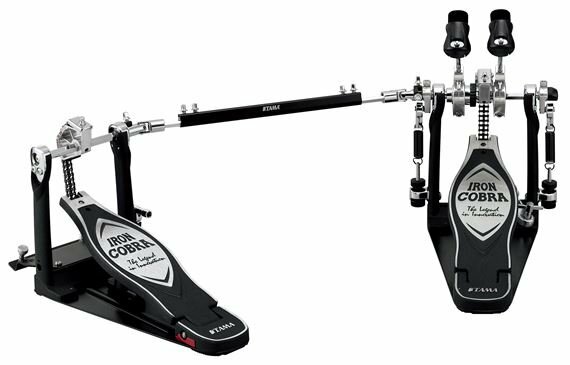 One of the most celebrated and esteemed bass drum pedals in the world, Tama’s Iron Cobra has set the standard through dedication to three key principles: Smoothness, stability, and adjustability. After more than 20 years of constantly proving itself in service to numerous drummers worldwide, the Iron Cobra continues to evolve and lead the industry in quality, innovation, and design. This pedal has a pulse. It's Alive! Great quality and adjustability that give and give. Love them but alas I had to give them up for two single Iron Cobra's. I switched from a single kick drum double pedal to a double kick drum with two single pedals. No regrets with both versions of Iron Cobra. Amazing Pedal! Great deal...thanks AMS! Everything you want in a double drum pedal! AMS makes it affordable with their flexible payment plan.